Coming into Week 9 on three-game winning streak, playing good football and facing a Colts' squad that was shorthanded at some key positions, I felt like the Miami Dolphins had a realistic shot at taking this one on the road. 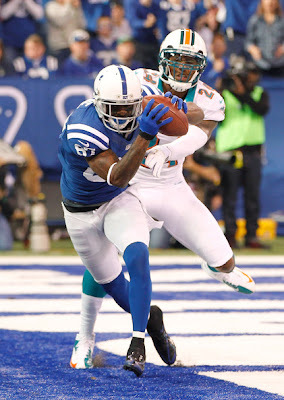 In the end, however, it was the highly-touted Dolphins' defense that let this one escape, allowing an incomprehensible among of third down (and third-and-long) conversions to give Andrew Luck and the Colts' offense opportunity after opportunity to keep drives alive and find the end zone. The 4-4 Dolphins will look to get back above .500 with a winnable game over the Titans at home in Week 10, but for now, here are my observations from the team's 23-20 loss to the Colts. I thought Ryan Tannehill played well in this one and I was glad to see him come out of it no more dinged up than how he entered. He's been a bright spot for the Dolphins this seasons and I felt this game was a good example of how he's getting better at reading defenses and making pre-snap adjustments. He missed on a couple touch throws but also made some beauties, including a long touchdown to Charles Clay. The pass protection and defense didn't do him any favors in this one, so I can't fault Tannehill for much of anything here. The running game wasn't really there and I thought the Dolphins got away from it a little too early. Reggie Bush and Daniel Thomas combined for only 16 carries and the run blocking up front wasn't nearly as dominant as I would have expected. I thought the backs did well with what the line gave them, as Thomas had some nice gains and Bush made a simply unbelievable cut on his touchdown run. Honestly, his change of direction on that play is about as good as you'll ever see in the NFL. Jorvorskie Lane continues to be an inconsistent blocker. He delivers a punch but sometimes he doesn't take the right guy and he's still not seasoned at opening holes for the backs. Brian Hartline and Davone Bess both had good days and pretty much caught everything they should have been expected to. Jabar Gaffney made a few nice grabs but also had his second drop in as many weeks. He played 30 snaps yesterday to Marlon Moore's eight but he still isn't having much of an impact. The tight ends really didn't make an impact in this one beyond Clay's touchdown. Anthony Fasano was limited to blocking most of the day and caught only one pass. This was probably the worst game I've ever seen Jake Long play as a Miami Dolphin, and something just isn't right with him. I don't know if it's the mounting injuries over the past few years or what, but he just doesn't look like himself. Long allowed two hurries, three pressures and a sack while committing two penalties (one false start, one holding). On one play, he took the inside rushing linebacker while leaving Dwight Freeney to be blocked by Daniel Thomas, who didn't have the angle to get to him. When Long is making those kind of mental errors, I don't know how to explain it, but I honestly don't know what the Dolphins will do with him now with his contract expiring in the offseason. The rest of the line didn't perform so well either. This was an uncharacteristically bad game for Mike Pouncey, who had been one of the best centers this season to date. Jonathan Martin also proved he has a ways to go, getting obliterated by the Colts' speed rushers. The Dolphins' pass rush was there in Week 9, with 14 hurries, 10 hits and a sack, but they still couldn't stop the Colts' offense. Cameron Wake was a terror even as he was held most of the game, while Olivier Vernon Jared Odrick and the interior linemen got in on the mix as well. Derrick Shelby actually had three hurries in just 18 defensive snaps, which was nice to see. That being said, it's a credit to how good Andrew Luck is, because he handled the pressure immensely well, consistently moving around in the pocket, evading the rush and making great throws at the last second. 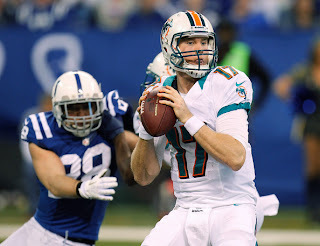 The Dolphins' rush did their job but Luck simply outplayed them. Paul Soliai and Randy Starks created pressure from the middle and did a good job stopping the run, but the reality is the Colts never needed the run to move the ball in this one. Even when Luck lost his starting center and the Colts switched right tackles, the Dolphins still couldn't disrupt him enough to take over the game. Like the defensive line, the Dolphins' linebackers did well against the run, but that's misleading because the Colts essentially didn't need the run. Overall the linebackers played well, with Kevin Burnett probably being the standout of the group. I thought Koa Misi's deep pass interference penalty was a bit weak and was simply called because he didn't turn around, as the contact really wasn't there. Karlos "Hall of Famer" Dansby dropped what could have been a game-changing interception, but perhaps I'm just being to hard on him. This was not a good day for the Dolphins' secondary. Actually, that might be the understatement of the year. Just when you think Sean Smith has turned the corner, he has a game like this. Smith was consistently beaten in coverage, lost a couple deep balls that could have been huge plays for the Dolphins and dropped a potential interception late. Combine that with Nolan Carroll getting thrown at a ton and Jimmy Wilson getting picked on, and it was an ugly day for the Dolphins. There is simply no excuse for how many third downs the Dolphins allowed, so often on crossing routes or comebacks. On the bright side, I thought Reshad Jones did some nice things, including some good blitzes and a tremendous forced fumble in the backfield that was recovered by the Colts. Overall he's having a very nice season and appears to be one of Jeff Ireland's better mid-round picks. Of course it was in a dome and neither kick was over 37 yards, but it's good to see Dan Carpenter have a clean game after some of his early-season struggles. Personally, I never worried about him and I think he'll be just fine. Just another day at the office for Brandon Fields, who booted four punts with a long of 60 yards and two inside the 20-yard line. Marcus Thigpen did a nice job in the return game despite not having any huge returns, while Olivier Vernon continues to make his mark on special teams with his second deflect field goal in as many weeks. Marlon Moore made a great tackle on special teams and cannot be blamed for a truly bogus holding call on a punt return late in the game. This was a game I felt the Dolphins should have won coming into it, but the reality is they just got outplayed. The Dolphins' defense had no answers for Andrew Luck even with consistent pressure and it's clear Miami lacks good depth at the cornerback position. Richard Marshall wasn't having a great season before his injury, but he'd certainly be a help out there. Aside from that, this was also one of the weakest performances I'd seen by the offensive line in a long time. The run blocking wasn't there and the pass protection was horrendous, even with Dwight Freeney having a down year and Robert Mathis pretty banged up. Jake Long isn't even playing at an average level right now and I honestly don't know how to explain it. There were some individual good performances, including another turnover-free game by Ryan Tannehill coming off an injury-shortened game against the Jets. I still like what I'm seeing from the rookie quarterback and I expect a better day from the rest of the team next Sunday against the Titans.